So it was the first day of our trip, and we were at Magic Kingdom! Some things were going on in the background that I didn’t know about until after, so I’ll share that at the end :). I knew I wanted to see the new “Once Upon A Time” show at 10:45, and I was ready to stay late. We were up around 5am that morning, so after Wishes at 10pm, everyone else headed back to the resort. After Wishes we decided to walk around the hub area to stretch our legs until just before Once Upon a Time started. After we watched that, then walked around a bit more. Ethan asked if I wanted to get a picture in front of the castle, because it was our first night seeing the Christmas Lights on it, and of course I said yes. 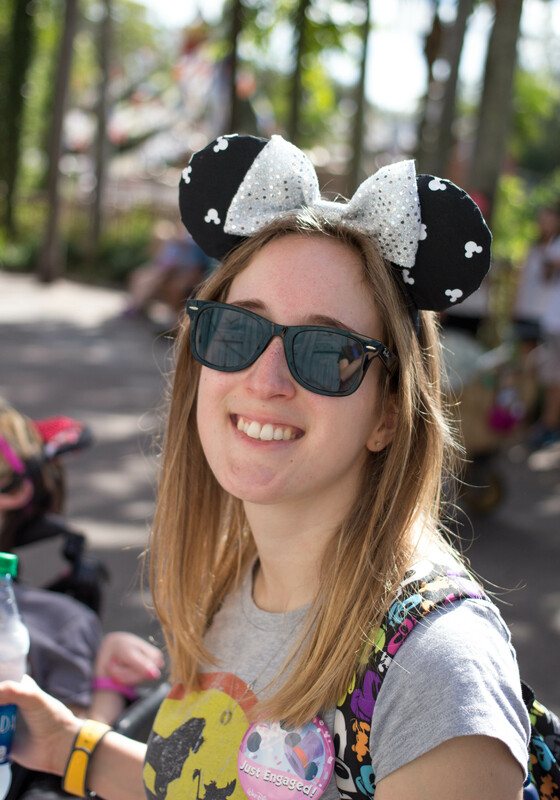 So we hung out a bit waiting for the park to empty and for the lines for PhotoPass+ photographers to get low. Ethan mentioned that I should take my jacket off (which was ugly and I’m glad I did), but it made me a little suspicious! So after a while we got in line, and then it was our turn to take our picture. Tuesday was supposed to be our sleep in morning, and it still was for everyone else but not us! I actually got very little sleep on our trip, something about being in Disney makes me wake up before my alarm! The day was had our pictures taken we were up at 6:15 for our 7:30 appointment (that lasted an hour) and we went to bed after midnight, from being at the Christmas party pretty much ’til the end! But I wouldn’t have it any other way! I asked Ethan if he wouldn’t mind sharing what it was like for him, so I’ll pass things over to him! 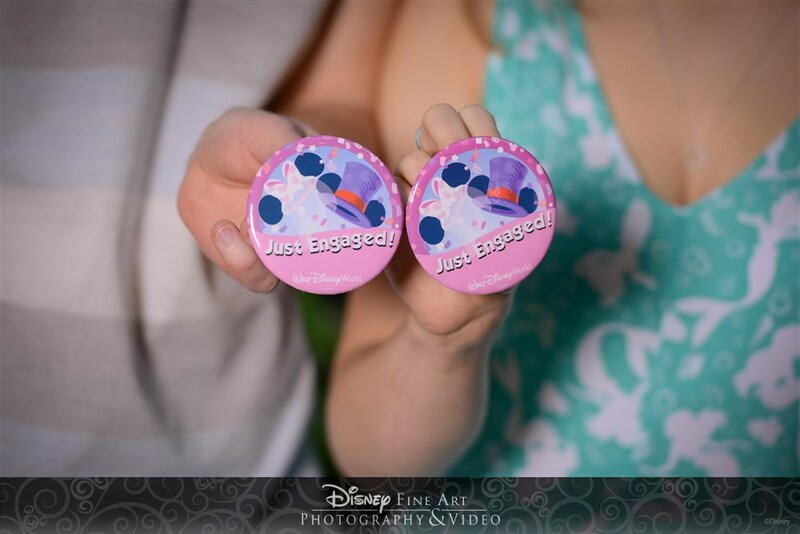 I bought the ring long before the trip and debated proposing prior to the trip, however because it was Disney and both our families were going to be there it just seemed like the right time to do it. I did a lot of research on my phone during my breaks at work to try and find a way to do it. 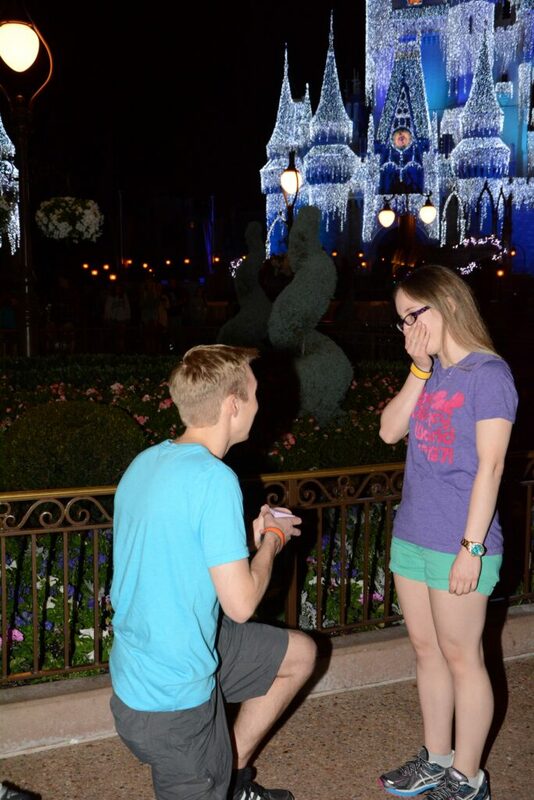 There are tons of ideas for Disney World proposals online varying from complex to more basic ideas. 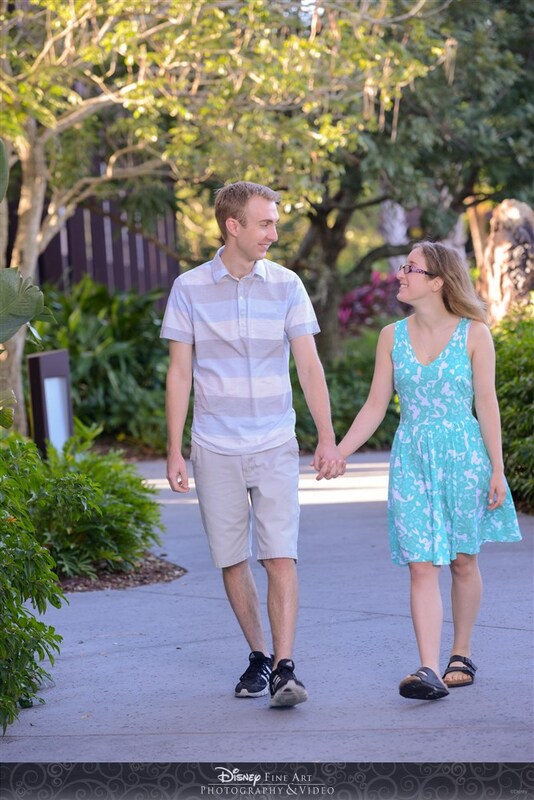 There are many options that Disney offers to make the event special, however most come with a Disney price tag. I looked for a while and found different ideas that I thought would be cool, but in the end I decided that keeping it simple was going to be my best bet, especially since we were travelling with a larger group and not just the two of us. In the end I decided what I really wanted was to get it on camera, which I could do with Disney PhotoPass. 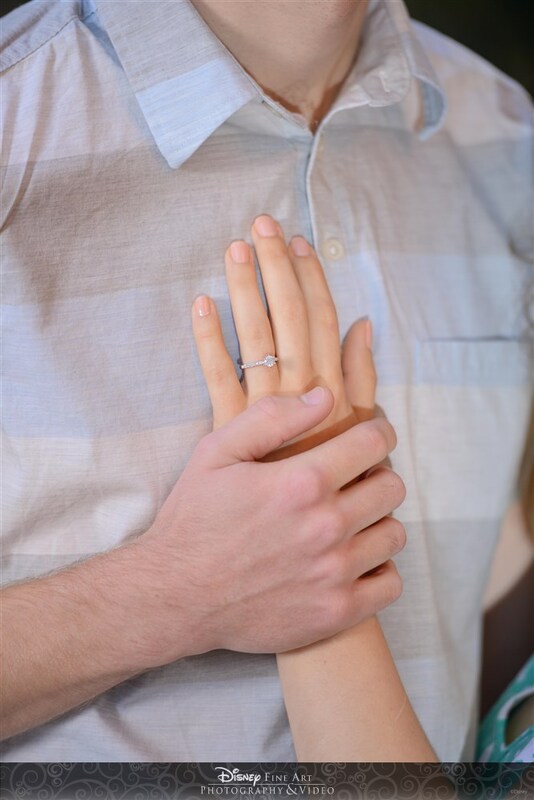 I knew I wanted to propose early in the trip so I did not have to worry about the ring and could celebrate after the fact. The first day we were going to the Magic Kingdom so it seemed like a good time, I thought proposing in front of the castle would be a nice photo, especially since it would have the Christmas lights. 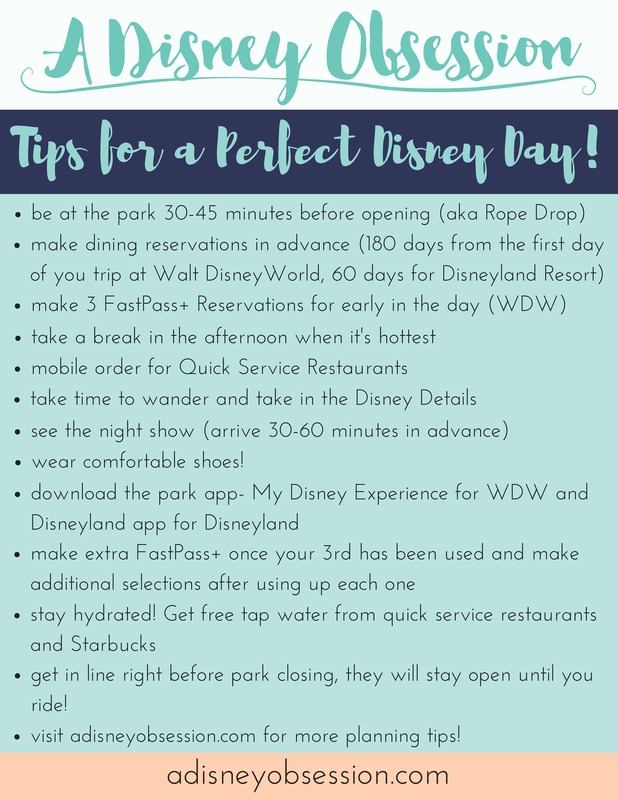 I suggest having an idea that can be adapted as you go, because you can never guarentee how a day at Disney will go. 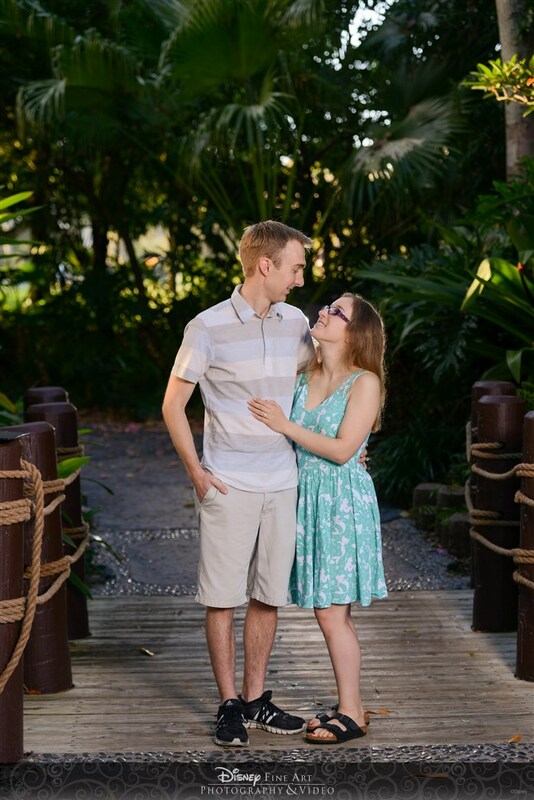 I originally planned to propose following dinner, but when you are trying to surprise someone that plans as much as Kelsey it can be hard, as plans were quickly made to go to Pirates of the Caribbean after dinner. 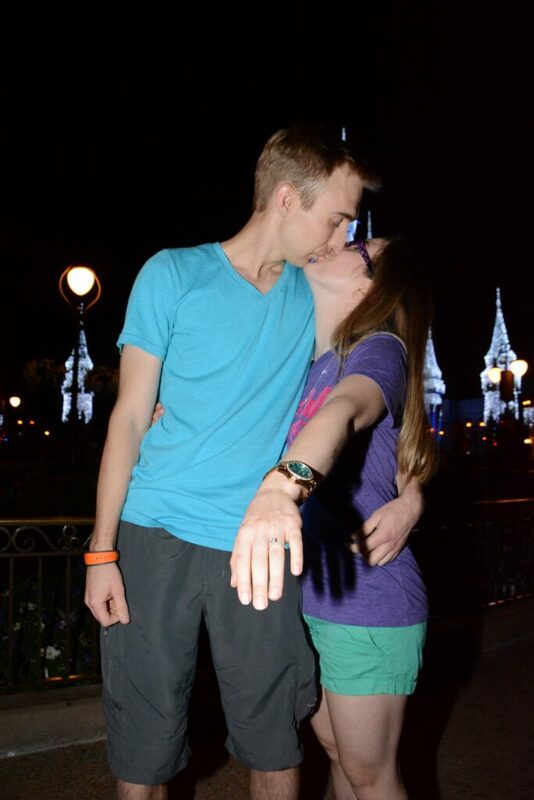 So, I then decided I would switch and propose after Wishes, so following the fireworks I asked Kelsey to go for a walk around the hub. 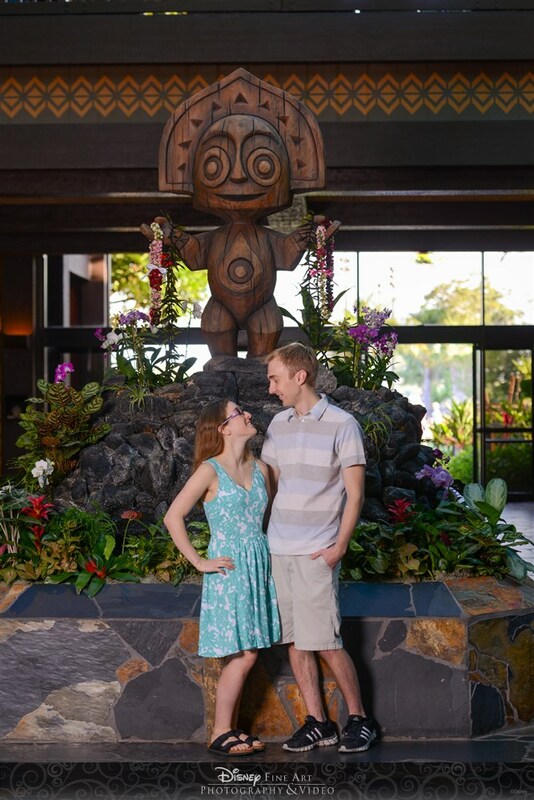 Everyone else had gone back to the resort for the night so it was just the two of us. The “walk” I sugessted was actually me looking for a PhotoPass photographer. I walked towards the area that I had planned on and which previously had a PhotoPass location (the rose garden, because we had gotten a picture there in 2012), however it is no longer there after the renovations to the hub. This caused a bit of panic, however I thought I’ll just have to find another spot with a photographer. As we walked I couldn’t find any PhotoPass photographers. The panic started to set in even more. I didn’t know what to do, should I wait for another day? 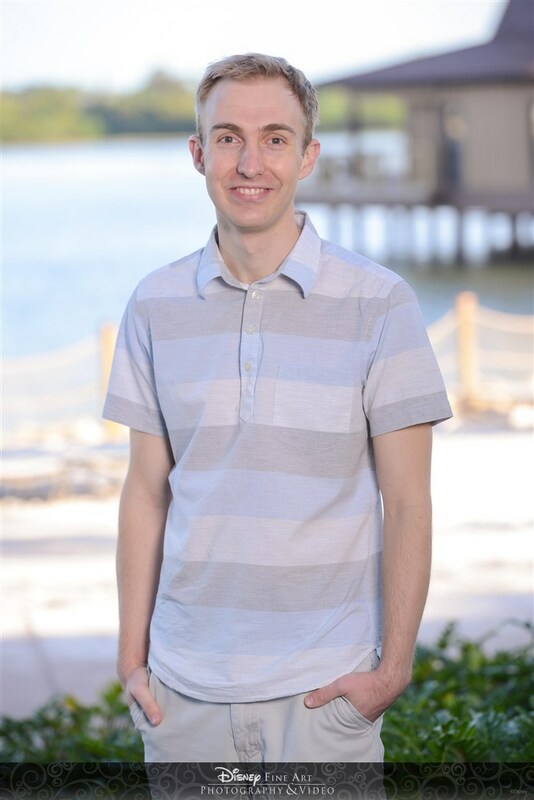 The problem was I had the Portrait session booked for Tuesday morning, and we were not going to be back at Magic Kingdom before that. We stopped to watch the new projection show on the Castle and I saw some PhotoPass photographers on the outside of the hub, waiting to set up their cameras after the show. I initially saw one that was waiting to set up on the right side of the hub. I was hoping not to have to propose in the middle of the hub because it’s so busy. After waiting a while the photographer never set-up. 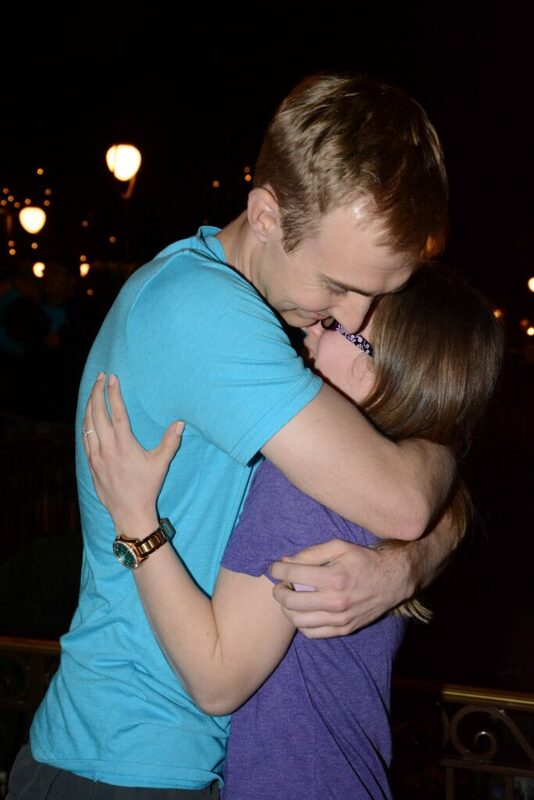 So I had to make a choice, propose in the middle of the hub in front of a lot of people or wait for another day. In the end I decided to go for it, after waiting for the initial crow to disperse following the light show I suggested we get in line for a photo in front of the castle. When we got to the front and it was our turn I let Kelsey go ahead and whispered to the photographer that I was going to propose. She was great as she said okay and then made an excuse to take the camera of the tripod. She took a few photos and then asked if there was anything else, which I assumed was my queue. I was very nervous at this point, I got down on one knee and asked Kelsey to marry me, at least in my head, I doubt my speech was very clear. Anyways when it was all said and done I am happy with how it turned out. I’m currently obsessed with wedding blogs, so if you know of any please comment down below! Thank you so much for reading our story, it means a lot to both of us! Thank you so much Aunt Jean! It beans so much to both of us. 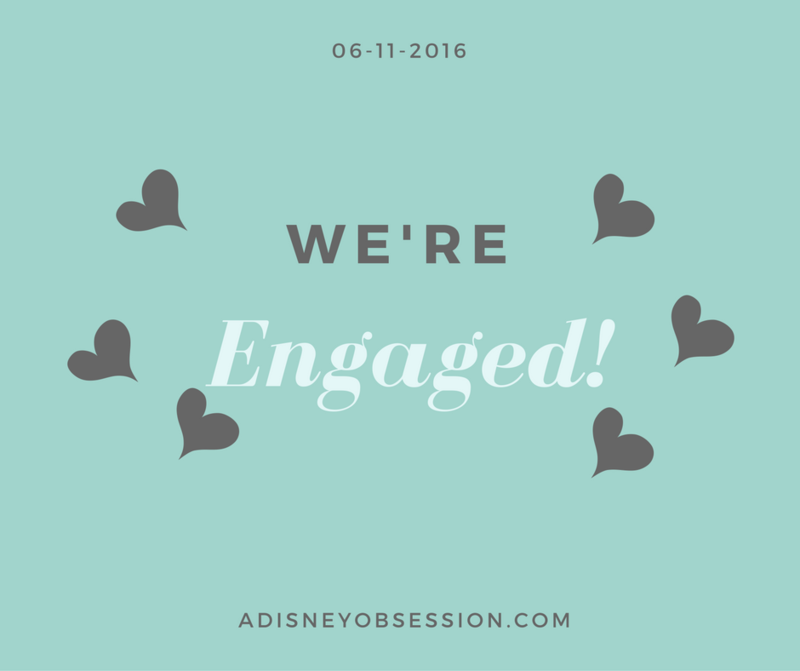 Hi Kelsey – Awesome Blog. Although I’ve said it before – -Congratulations to you both and your beautiful family on this joyous event. This is awesome – When did you become this beautiful young woman… So happy for you. All the best and have fun planning and experiencing EVERY moment.